When you go to Quilt Market, you know you're in for a big, memorable experience, and Fall Quilt Market this year was no exception. I saw lots of beautiful quilts and fabrics, loads of fantastic people that I don't get to see anywhere near as often as I'd like, and generally had a blast, in spite of the Texas-sized blister my adorable but apparently heinously uncomfortable shoes gave me. 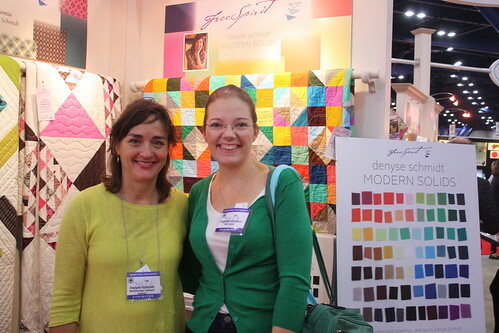 It's always so fun to get to see all the amazingness the quilt world has to offer all in one place, from the fantastic people to the drool-worthy fabrics! Denyse Schmidt has a new line of solids coming out for Free Spirit, Modern Solids, which are just lovely. 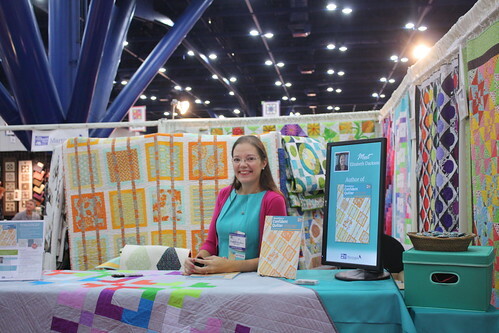 I made a quilt for her booth using the new solids, my Sparkling Diamonds quilt, and got a chance to say hello to her during my time in Texas, which was awesome. I'm pretty sure that I was a geeky fangirl, because I adore Deynse's work so much, but she was positively gracious and so nice! Her new Ansonia collection of prints is also quite lovely, especially after seeing it in person. Carolyn Friedlander's new collection, Botanics, is going to be the kind of collection that breaks the bank. With over 30 prints in the collection, each one more drool-worthy and stash-necessary than the last, this one is going to be really big when it comes after Thanksgiving. You can even preorder it with Pink Castle Fabrics right now if you want to make sure to get it before it sells out! Cotton + Steel is going to be an epic new set of collections under RJR Fabrics. Some of my most favorite, talented designers all under the same label? Awesome! Vanessa Christensen of V + Co is always so fun to see at Market. She was sporting a skirt made by her official skirt sponsor for Market, Miss Amylouwho, which was so darned cute. Every time I see the skirts Amy makes for Vanessa for Market, it makes me want to make a skirt. Then I remember that garment sewing scares the heck out of me and I back off! Anyway, Vanessa's new line, Color Me Happy, is so bright and fun, and uses the same principles we've seen in her past two lines in a new color scheme, so there's lots of great blenders and bold prints that you'll want to stash here. Seeing Jen Kingwell's fantastic work in person was also a great thrill. If you haven't seen her patterns before, you simply must check them out. They are positively stunning. My schoolhouse and signing for Becoming a Confident Quilter went really well, in spite of all my nerves! If you were at either and took photos, please do email them to me, I'd love to see them!! In addition to presenting a Schoolhouse, I also got to attend several Schoolhouses, which was really fun. 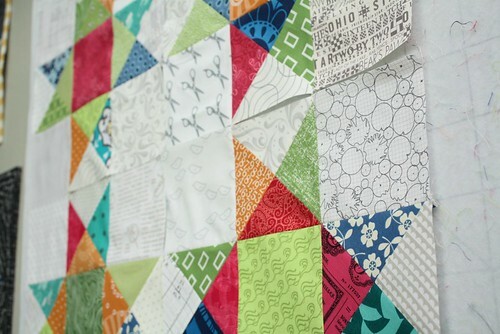 I think my favorite was for the to-be-released Vintage Quilt Revival by Katie, Lee, and Faith. You really need to make sure you've got this book on preorder! I got to flip through an actual copy, and it's just lovely, I can't wait to have a copy of my own. There's more than one new must-have collection of solids coming out soon - Alissa Haight Carlton has a new selection of solids coming out with the In the Beginning Modern Solids group. Having worked with the Modern Solids solids recently for a magazine project, I can tell you firsthand how amazing the hand and drape of them is! Jacquie Gering and Jen Carlton Bailly made fabulous quilts for Alissa's new line, and I just adore Jen's. 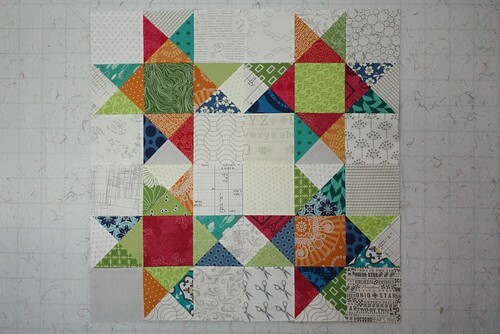 Jen makes me want to tackle curved piecing and own it the way she does!! For more pictures, pop on over to my Fall Quilt Market Flickr set to see loads more shots of schoolhouses and booths and such. I'm still working on labeling them all, so bear with me, but enjoy! And have a great Wednesday! Spring Quilt Market 2013: Fabric sneak peeks! Violet Craft's booth! Violet was sharing her upcoming Waterfront Park collection for Michael Miller, which should be arriving in stores this summer. Violet has such a bubbly, infectious personality, it was fun getting to visit with her. I especially adored the bridges quilt behind her, it's really stunning in person. Also in the Michael Miller booth, I spotted a great upcoming line from Emily Herrick. I especially loved the movie theater seats that Emily recovered in her new line, Technicolor. I adore the colors in this line, it's so bright and cheerful. I was also really excited to see Mo Bedell's booth. Mo is such a sweetheart! She featured her newest line, Full Moon Lagoon, in her booth as well as her next line, Hothouse Flowers, shown in swatches to the right of the seahorse quilt. Mo won a ribbon for her beautiful booth, for best new exhibitor. So exciting for her! Another line I was pumped to see was Denyse Schmidt's upcoming Florence line, which should be in stores at the end of the summer. No surprise here, but it's gorgeous and brimming with all of the things we love about Denyse's past collections: beautiful, rich colors, small prints that are so easy to use, gorgeous stripes, and a fantastic vintage feel. I will definitely be getting lots of this collection! The Kokka booth was also outstanding, full of Melody Miller, Echino, and Ellen Luckett Baker fabulousness. Melody's next line even has a small cameo of the viewfinders from her first line that have been so beloved and impossible to get. Melody also wore a fabulous dress made of the arrow print while she was at Market, but I didn't manage to get a good picture. I also enjoyed seeing Jeni Baker's new line, Nordika. While the colors aren't colors I would normally attribute to her, as soon as you see the fabrics, the collection is totally Jeni. I loved the embroidery hoops hanging in her booth and the mix of both fun garments and quilts showcasing the new line. The Cloud 9 booth was so cheerful. It's entirely possible that it's mostly due to a big dose of Pigeon. Oh yes, Mo Willems's famous Pigeon from his books has made it to fabric! I know my son would love to have a pigeon quilt on his bed. The other fantastic thing I saw in the Cloud 9 booth was Rashida Coleman-Hale's upcoming line Koi. Rashida's booth featured booth Koi and her current line, Tsuru, but Koi definitely was the showstopper of the booth. With a similar color palette to her super-popular Washi line, but fresh, new prints. Rashida's sunny personality really comes through in this line, which will be available in both quilting cottons and voile. 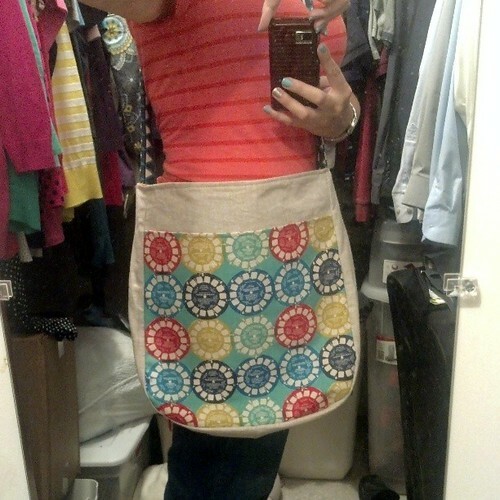 To Market, To Market...with a new bag! 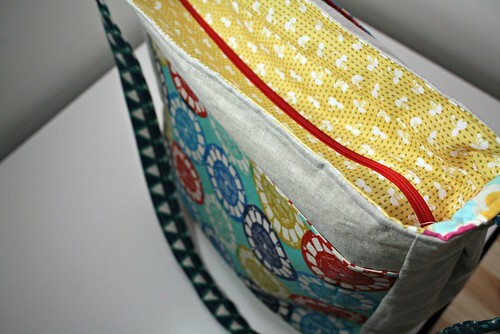 Whenever I travel, especially on quilty adventures, I feel the need to make a new bag. 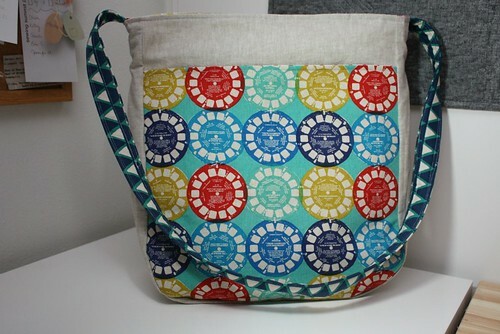 And usually this feeling doesn't come over me until the last possible moment, so right on schedule yesterday, I found myself desiring a Super Tote. Have you seen these bags? It's probably Kelly's fault, because she made a gorgeous one adorned with applique leaves for Tracey, come to think of it. All the same, Anna, as always, wrote an amazingly easy to follow pattern that yields beautiful, professional looking results. I am super excited to board a plane to Portland today carrying my new bag. I love this bag. It's huge. I could probably even fit my laptop in here, but I'm not going to try on this trip. Inspired by Kelly, I made a few changes to the bag - I added the exterior pocket to both the front and back of the bag, because I like pockets and I added a crossbody strap rather than two shorter straps. At Market, you wind up lugging a bunch of stuff around, so I figured the crossbody strap would be way more comfortable. I used Essex Yarn Dyed in Flax for the linen bits, Melody Miller's amazing viewfinders in aqua for the exterior pockets, Madrona Road Sprout in Straw for the lining mixed with an old Kumari Garden print called Tarika for the lining gusset. I only wish I'd bought a whole bolt of the viewfinders when they came out, now that they're out of print! All in all, I'm really happy with how this turned out and have plans to make a second one for Jacquie. She jokingly asked me to make her one to bring to Market, but rather than rush through it, I'm going to make it for her after I get home. She can use it to cart some of her necessities to all of her wonderful classes that she's teaching these days. You should check to see if she's teaching near you, because she's seriously awesome! I'll be back with loads of pictures from my trip next week, and I will indeed be posting to Instagram (with my terrible camera phone) while I'm away if you want to follow the #quiltmarket fun. Have a wonderful rest of your week! While I am super bummed that I wasn't able to go to Fall Market in Houston, I was really excited to have some quilts of mine representing for me :) I was lucky enough to work with Westminster/Free Spirit Fabrics on a few quilt designs for their free patterns site, and also made up one quilt for a booth. The quilt that I actually made for Market was for Ty Pennington's latest Impressions line, called Tribal Impressions. The design is actually based on a tribal tattoo that I saw and sketched a while back, and I think it works really well with Ty's fabrics, which often feel a bit tribal to me. The block is made up of forty half-square triangles. Seriously. I had some quality trimming time on my hands with this quilt ;) Working on this quilt led to a couple of really long nights, trying to finish it up and get it in the mail before leaving for Sewing Summit, but I'm really happy with how it turned out. It was so wild to see photos popping up on Twitter of Ty Pennington and various quilt shop owners and bloggers in front of my quilt in his booth. Totally made me feel super proud. :) Thanks so much, Kim, for taking a great picture of the quilt in the booth for me! I also wrote patterns for Felicity Miller's new Charleston Farmhouse line and Denyse Schmidt's upcoming Shelburne Falls collection, both of which are really lovely. I'm especially excited about Shelburne Falls, I love the color palette. 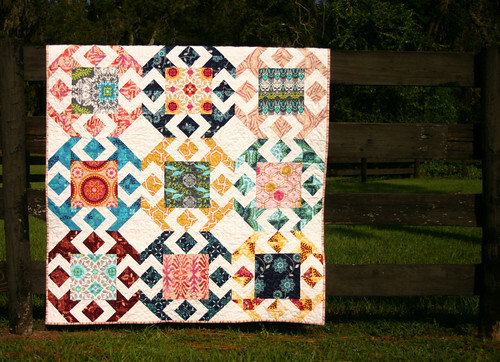 The Charleston Farmhouse quilt did get made up for Market by someone else (thank you!! ), and was really stunning. You can find the Charleston Farmhouse pattern right here and the Shelburne Falls has not yet been released. I'll update this post once it's out! My Simply Squared quilt also hung at Market, in the Interweave booth, along with a large posterboard of Quilt Scene magazine. I'm excited to get this quilt home again soon, I'm planning to give it as a holiday gift to someone who will really appreciate it. I think I'm as recovered as I'm going to be from the fabric hangover I experienced on my trip to Spring Quilt Market in Kansas City, so I figured it was time for a wrap-up post. It was a fantastic trip, with boatloads of gorgeousness to see and super fun people to visit with. Aren't quilty people just the best people? 10. Riley Blake Chevrons - I love that Riley Blake is bringing these chevrons in multiple sizes, I think it is a super smart decision on their part, too. There will be not only small, medium and large chevrons but also tonal varieties in each size. All of the varieties should begin shipping in August, and I know I will be picking up quite a few of these for my stash! 9. Art Gallery - Art Gallery swept many of the booth awards at Market, and rightly so; their booths were just so stunning. The wall of their main booth was covered in squares of all of their fabrics, all mixed together and backed with foam core. Their Summerlove side booth was also gorgeous and so cozy feeling. I couldn't resist, I just had to pick up a little Summerlove to bring home for a new project! I'm also really excited about their upcoming Rock & Romance collection, coming out in September. 7. Chicopee - I adore Denyse Schmidt's fabrics, so it was really exciting to get to see Chicopee in person before it comes out. Denyse's booth had a few precut samples to thumb through and also a wonderful wall of inspiration for the collection, complete photos of Sonny & Cher, Mary Tyler Moore, and many other remnants from her childhood. The collection is full of what Denyse is best known for: beautiful small-scale prints with rich colors. I'm seriously looking forward to this collection when it ships out in August. 6. Simpatico - Coming in June from Cloud 9 fabrics, Simpatico is full of soft peaches, grays, and blues. I'm super excited for this line. The prints have a real classic feel to them and I think this line will make a great addition to any stash. I also spotted GeoCentric, a new canvas collection coming late summer, full of super fun geometric basics. Awesome line for bag-making! 5. Storybook Lane - Kelly Lee-Creel is a new designer for Andover Fabrics, with a new line called Storybook Lane, shipping in the next few weeks, and several new patterns for her Ever Kelly brand as well. Her booth was gorgeous, and I especially enjoyed the star quilt Kelly featured. 4. Ruby Star Vinyl - Melody Miller's new line Ruby Star Vinyl is so hotly anticipated and rightly so. Her booth was total retro chic, from the Ruby Star Shining sofa to the cool retro record wall installation. No one does retro quite like Melody. 3. Mama Said Sew - Coming out in August, Sweetwater's Mama Said Sew is full of black, cream, gray, and red prints that celebrate sewing. There's some beautiful text prints as well as an adorable gingham. I think this was one of the first lines to sell out at Sample Spree and I think it's going to be super popular! 2. Madrona Road - I positively adored Violet Craft's first collection for Michael Miller, Peacock Lane, but I think I might just love Madrona Road even more. I'm not sure if it's the soft colors or the cursive print, but I'm head over heels for this collection. Is it August yet??? 1. Bloomsbury Gardens - Some of the biggest buzz at Market was all about Liberty of London releasing new quilting cottons. One of the things I really like best about the new line is that while still gives the Liberty vibe, the colors are very different. Very vibrant, very bold, and perfect for quilting. 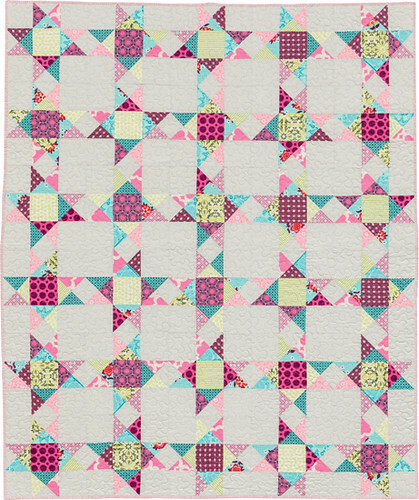 I recall a while back that Liberty did a quilting cotton collection with Westminster Fabrics, and I think is a very different line from that one, consciously so. We got to meet the designer behind the collection, who said that the color choices and motif choices were very deliberate, that they truly thought about quilting and how to make the collection work best for quilters. I think this collection is a full-on home run, and I cannot wait to get some! Sample Spree was also quite fun, with boatloads of grown women squealing when the line finally started moving and we were allowed in. The Moda table, by far, was the busiest, with a huge crush of people swarming around it. The Art Gallery table also seemed quite busy, with gorgeous stacks of their solids, Oval Elements, and other print collections as well. In other Market news, I got my hands on my some fabulous new quilting books that I cannot possibly recommend highly enough: Quilting Modern , Modern Patchwork , Zakka Style and Sunday Morning Quilts . Not only that, but the authors were some of the nicest people I met during the entire trip. My flight home was made way more bearable by these wonderful books. All in all, Market was simply amazing. I could probably write a post a day about Market and still have more to tell, but for now, this will do. There were so many fantastic things to see, and while I do think I saw them all, these were the ones that stood out to me. I also had the chance to meet so many wonderful people that have shaped me as a quilter and to meet even more people that I've only known online, who were even nicer in person. This trip to Spring Market is definitely going down in my book as one of the best trips I've had in a very long time. 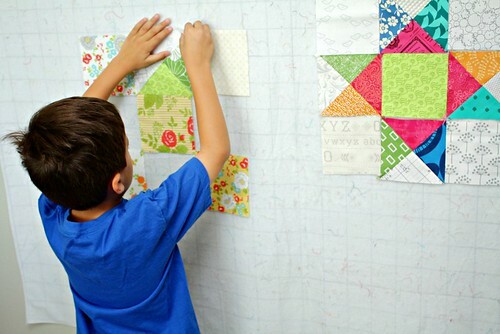 For more Market wrap-ups, you can visit Freshly Pieced and Sew Sweetness.